AB Dynamics will be exhibiting at the upcoming Testing Expo events in Shanghai, China and Novi, Michigan, which take place in September and October 2016 respectively. We will have a Guided Soft Target and new types of driving robots on display at both shows. 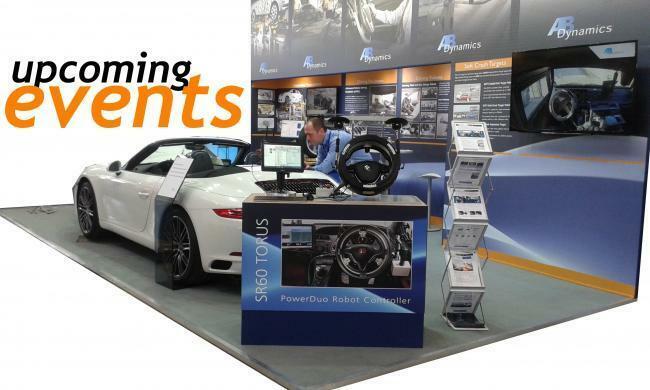 AB Dynamics is also attending the Driving Simulator Conference in Paris, where we'll be on booth #3, presenting our aVDS driving simulator product. Finally, we'll be at the Automotive Testing Show at Millbrook Proving Ground in December, with demonstrations of driving robots.